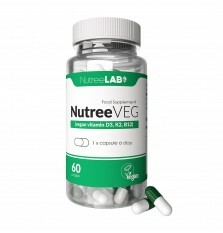 NutreeVEG - vegan food supplement containing vitamins D3, B12 and K2. 60 Capsules. The high quality of the product is ensured by manufacturing in compliance with pharmaceutical regulations (GMP standards). 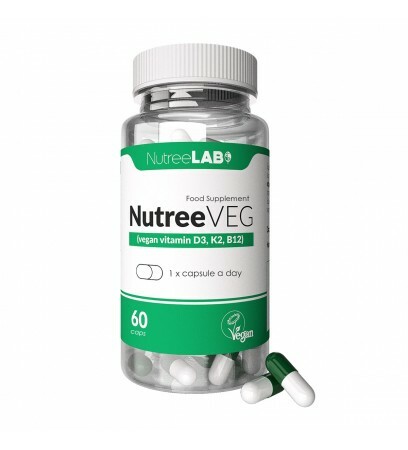 NutreeVEG is registered by the Vegan Society. 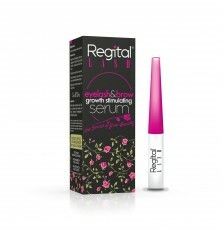 VITAMIN D3 Organic compounds based on a steroid structure which affects a variety of physiological actions, fat soluble. Most important are two forms of vitamin D, distinguished by their type of side chain: ergocalciferol (vitamin D2) and cholecalciferol (vitamin D3). Bone structure: Vitamin D influences processes of absorption and elimination of calcium and phosphorus. During a growth phase, it participates in forming bones and teeth. Vitamin D deficiency in children leads to rickets, impaired bone mineralization, and bone softening. In adults, it leads to bone aches, osteomalacia and osteoporosis. 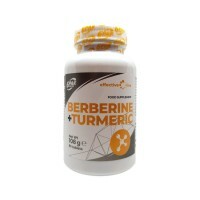 Vitamin D supports the immunological system by activating defense proteins. Nervous and muscular system: Beneficial influence on the nervous and muscular systems is related to increased neuron regeneration and increased muscle strength. Vitamin D deficiency leads to myalgia and myopathy. There is a correlation between levels of vitamin D in the blood and sleep disorders. During pregnancy, a low vitamin D blood level may be responsible for acoustic disorders in newborn children. Immunological system: Vitamin D3 may act as an immunomodulator, which may be considered as an antibacterial agent. It activates transcription of genes which code antibacterial peptides (natural antibiotics) – cathelicidin and β-defensin 2. Some research has revealed that vitamin D supplementation during childhood may result in a lower risk of type 1 diabetes. Higher levels of vitamin D3 in the blood may reduce the risk of SM (Sclerosis multiplex). Cardiovascular system: Vitamin D regulates the renin-angiotensin-aldosterone system. For this reason, any deficiency may lead to hypertension and heart failure. Metabolic action in other tissues: Vitamin D stimulates liver regeneration capabilities. Antiproliferation, antiangiogenic, and inducing of apoptosis functionality. Impaired bone mineralization and bone damage.